Kuku Sabzi is by far my most favorite type of kuku. This dish is pretty easy to make and it’s so delicious! 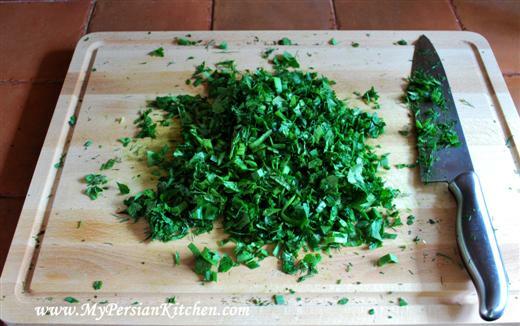 Remove stems from all herbs. 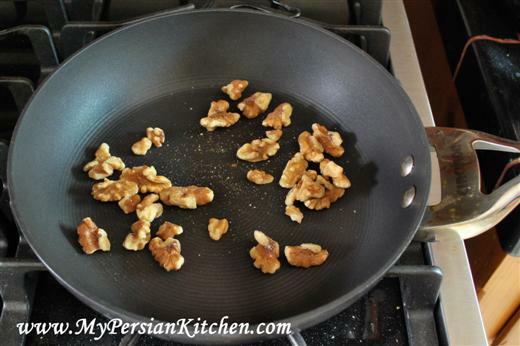 Toast the walnuts for a few minutes. Place eggs in a bowl. Add baking powder, salt and pepper. Mix well. 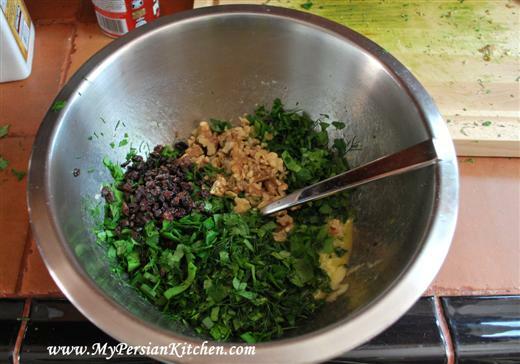 Add herbs, walnuts, and zereshk to the eggs. Mix well until all nicely incorporated. Warm up a non-stick pan with some oil. Place the egg and herbs mixture in. Cover and cook for about 20 minutes on medium-low. 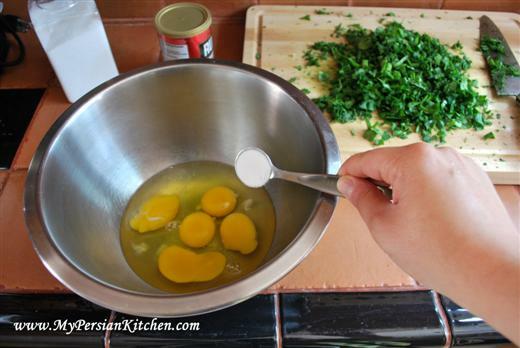 Cut the kuku into four pieces and carefully flip each piece. Cover and cook for another 20 minutes or until kuku is cooked through. Cut kuku into 8 wedges and place on a serving platter. I love your site. it is nice just like you. I wish you a very good new year and lots of happiness with your dear husband. Thank him for me for all the helped he did on our bazar. Homeyra Joon, thank you!!! Norouzeh shoma mobarak! Best of wishes to you, your husband, and your sons! Hope to see you soon! This recipe seems very similar to the recipe my mother-in-law (current reigning champion of koo-koo-sabzi) uses to cook it up. As you know getting a qualified recipe from a Persian mother is near impossible, so this is very helpful. 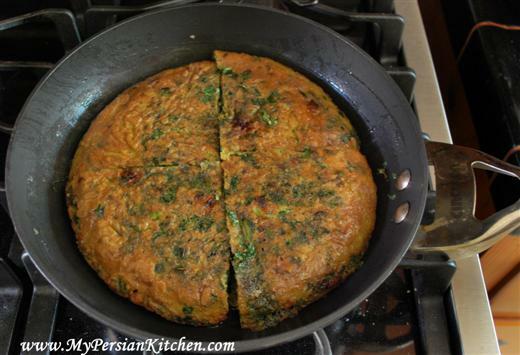 I would also add that this is one of the few Persian foods that is not only delicious warm but can be eaten at room temperature or cold which is why it’s great for picnics (with Hollywood Bowl / Summer coming up) or boxed lunches. Omid, I agree, it’s delicious warm or cold, as well as sandwiched in lavash bread! Yum! I have never made it for our picnics to the Hollywood Bowl, but that’s a great idea. There are three shows that I am looking forward to seeing this summer! I really enjoyed making this, the first time I’ve ever put baking powder into eggs and loved the herbs. 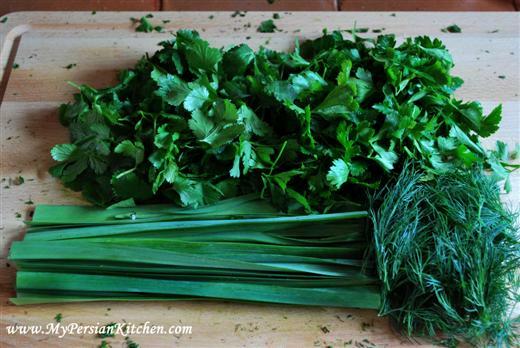 But, my cilantro doesn’t look like what you use in the picture. Mine doesn’t have stalks and looks a lot like flat leaf parsley. Is that a different kind of cilantro? Candace, I have no idea why your cilantro looks different. Can you take a picture of it and send it to me? Also, I’m cooking the barberries in rice tonight, following (almost) the recipe, and I cooked the berries in the butter and sugar. Should they also have been cooked that way for the kuku egg dish? We ate this last night and loved it. Candace, interesting…I wonder why they are different. The ones that I get here are a lighter shade of green than Parsley and are completely flat. No need to cook the barberries in the butter and sugar for Kuku. Just wanted to tell you that your blog has been especially helpful to me these last few weeks during Persian New Year preparations. I finally made kuku yesterday and was very proud of myself. 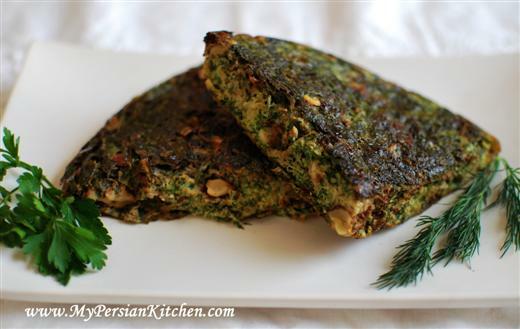 I look forward to making more Persian Kitchen recipes. Thank you! Woohoo Vanessa! You go girl! I am sure Payman was happy! I just discovered this website and I really like it so far. Just wondering, why does this take 40 minutes to cook? That seems like a long time for eggs…. Shira, it takes a while to cook because kuku needs to be cooked on lower temperature in order for it not to burn. Also, it is pretty thick so it takes a little while. I really enjoy your site. I have made Koo Koo sabzi a few times before. I don’t know why I don’t make it more often, as it is a great “light” dish. Question: My mother in law adds lettuce to the mixture…I haven’t done that in years, but when I was learning from her all those years ago, she added lettuce, parsley, dill, and spinach. Did you ever use those herbs or veggies to cook your koo koo sabzi? Jen, I have heard of people including spinach in kuku sabzi, but I had never heard lettuce before. What type of lettuce does your MIL add to it? I only use herbs as that’s the way I was taught to do it. Hi..thanks for your reply. She uses the outer leaves of the lettuce head. I think she just wants to use them for something, so she adds them to the koo koo. Anyway, I made it last night (without the lettuce), and my kids LOVED it…I was surprised, because my 17 year old son is very picky…but, he said, “you should make this more often” . I was thrilled, as it is so easy to make, and healthy….thanks agian!! I LOVE your blog!The pictures are fantastic and provide a helpful step by step guide for us “non-Iranians”! I just wanted to comment on your ingredients. The picture appears to show tareh, but is not listed as an ingredient. 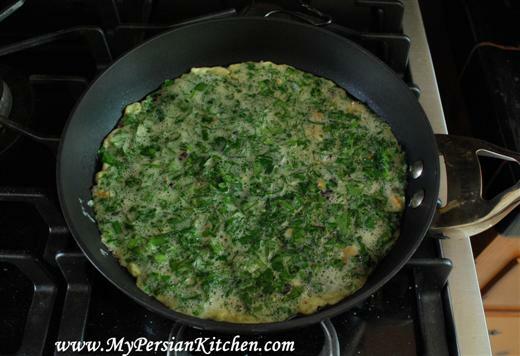 I have always added tareh or green onion to my kuku sabzi. Am I correct? Elizabeth, you totally got me on this one! Thanks for pointing it out! ho trovato per caso il tuo sito e ti faccio tanti complimenti. Trovo le tue spiegazioni semplici , chiare e pratiche. Ti auguro un mare di bene, continua così. Giovannina, grazie! Spero che continuerai a leggere il mio sito! Thank you for your posts…and for making my mouth water! very interesting and easy to make. I am looking for an easy, Nowrooz appropriate dish to make as an hors d’oeuvre for an educational event about the holiday I’m helping organize at my university. Since I will be in classes all day, I need to make it the night before. Would Kuku Sabze store OK in the fridge for 24 hours? Also, I will have to serve it cold or luke warm since I won’t be able to heat it up at the event. If you don’t think it will work, do you have another suggestion? Thanks!! Shaheen, I think that Kuku Sabzi is a great option. You can definitely make it the night before. I wouldn’t serve it cold, I would either serve it warm or at room temperature! Wow just came across your site, amazing! i’ve missed my grandma’s persian dishes sooooooo much and reading about some of the dishes you have mentioned well brings back memories! Living in Iran and smelling the aroma and wow, now i can at least cook some of these, you have made it very simple to explain and show. thank you very much! Best recipe! Thank you very much! Both Ar and I love Salad Olivieh — that at the bottom of this email. Personally, I know that when I was growing up, I would never eat KUKU with all those “greens” (ick! ), but remember mommy making it along with a pot of boiled potatoes with skins on. I loved the small boiled potatoes. I remember mommy saying that the Kuku egg mixture had to be BEATEN BY HAND … not a mixer… (I think she’d use 1doz eggs in a HUGE bowl with a wooden spoon) and you can’t stop beating it till it was all light and fluffy & frothy, eggs with slowly added finely chopped greens, (remember, it’s a SOUFFLE) otherwise the eggs would just separate from the greens and lose all it’s pouffiness and “fall.” When I returned to NJ as an adult (31yrs old), I finally tried her kuku and it wasn’t bad at all. I think I did get mommy’s recipe for Kuku and others between ’89-93 when I lived in Staten Island and she was still in NJ. Of course, she never measured anything when cooking, and she was doing from memory with telling me apx portions (a capful of this, a coffee cup of this, etc). I never made it, but seeing this recipe, I think I’ll make it in memory of mommy (she died in Jul 2006). I’ll have to see if I can find my handwritten recipes that she recited to me and I wrote down. Mommy would also add a touch of curry I think to KUKU, because mommy’s family was from Isfahan, that was on the Spice Route to INDIA. Isfahan seems to be the 1 city of Iran where cooks did use curry in many dishes and other Iranian cities don’t. (ie – I love Khorasht, bamia especially, and I do as she did… add curry along w/ cinnamon, but again, cooks from other Iranian cities don’t add curry). ps – Googling and looking for SALAD OLIVIEH (Olivia) and found this site amongst many other. Sounds great!!! I’m going to make it and check out her other recipes too! Linda, thank you so much for your kind words and passing MPK along!!!! can you use any other nuts in this recipe or non at all? i am afraid with the berries it may become to sour without the butttery nut flavor. Erica, yes, you can omit the nuts. Hi Deb, I have never seen what you describe, but sounds pretty!